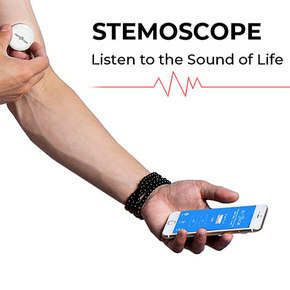 The innovative Stemoscope untethers the stethoscope so the user can explore the sounds of life. The palm-sized Stemoscope pairs with a smartphone via Bluetooth, delivering the captured sound as audio as well as a waveform and spectrograph. Because the unit is wireless, it can be easily placed on a variety of objects and surfaces to record the often unheard sounds of the natural world. The Stemoscope includes a handy strap that allows it to be safely attached to pets or trees, and its rechargeable battery offers up to five hours of continuous use.